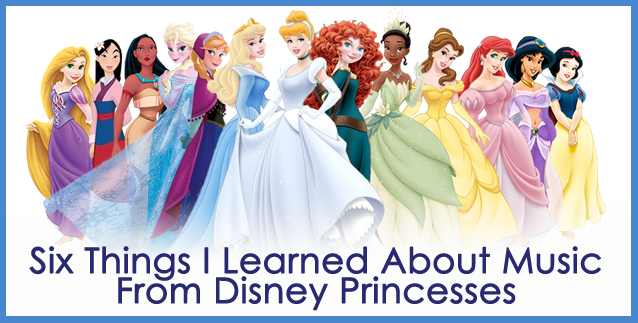 Many of us grew up with Disney’s sorority of impressively musical princesses, and today’s kids are no different. The musician in me always wants to know how all those princesses learned to sing consistently on key despite being chased by evil queens, relegated to housekeeping duties, locked up in towers, and raised in the woods. I’m still not sure, but I can offer a few tips from these magical stories to help us all brave the perils of the practice room. Elsa (Frozen): Let it go! If there’s one thing we learn from Elsa, it’s that sometimes you have to break out of the external constraints that are holding you back and experiment with the gifts you’ve been given. Of course, throwing off all the rules and doing your own thing isn’t always enough to get the results you want (Elsa taught us that too), but any artistic endeavor requires the courage to reach further than you thought you could in order to create something beautiful. Aurora (Sleeping Beauty): Be patient. All good things take time. Aurora and the good fairies waited 16 years in an attempt to outwit the evil fairy Maleficent, and when that didn’t work, Aurora patiently slept in the tower while waiting for Prince Philip to rescue her (okay, maybe that’s stretching it). The point is, when you’re just starting out in music, it may seem like you’ll never be able to master that song, play in the band, or perform on stage. At least half of what makes a good musician is refusing to give up when the going gets tough. Keep at it, and you’ll see results. Tiana (The Princess and the Frog): Work hard. But have fun too. Tiana is perhaps the hardest working of all the princesses. She set her eyes on her goal and she wasn’t going to let anything get in her way—not even love. But it took new experiences and different perspectives for her to realize that achieving her dreams meant embracing the spontaneous parts of life too. Like Tiana, we musicians can get so caught up in technical perfection that we forget music is supposed to be fun. Sometimes, we all just need to take a break and enjoy the music. Duchess (The Aristocats): Practice those scales and arpeggios! Duchess isn’t strictly a princess—she’s a wealthy cat who belongs to an opera singer. But she knows the value of scales and arpeggios, and she’s determined to teach them to her kittens! While it is important to have fun with music, it’s equally important to focus on the technical details that help us become truly skilled. Rapunzel (Tangled): Sometimes you have to leave the tower. Rapunzel could have stayed in her tower forever, doing the things she knew how to do—but then she never would have discovered who she truly was. I like to think of the practice room as the musician’s “tower.” It’s easy to stay in there and feel good about ourselves, but we can’t truly know what we’re capable of until we step out of our comfort zone. Whether we’re performing in a spring recital or on the stage at the Met, we haven’t reached our true potential until we share our music with others. Ariel (The Little Mermaid): Parents, it’s okay for your kids to be different. If King Triton had embraced Ariel’s unique personality and used his influence in a positive way, she wouldn’t have ended up in Ursula’s clutches. Parents, it’s okay for your child to have different musical tastes and to enjoy different kinds of music than you do. Encourage them to be the best they can be with their own skills and abilities rather than trying to force them into being something they aren’t. Let’s face it. Learning an instrument is hard work. There are all those notes to master, plus intonation, dynamics, harmony, rhythm—it’s easy to get bogged down and frustrated, especially when you’re just starting out. At times, we all need to let our hair down and learn to have fun with the music. We may not all end up harmonizing with birds in the forest, but we can all reap the many benefits that come from embracing a life filled with song.